The naturally aspirated, entry-level 3.6-liter V-6 gets 10 more horsepower, for a total of 310. The engine is Porsche's own—essentially the 4.8-liter V-8 minus a cylinder from each bank—and it has nothing to do with the Volkswagen-designed 3.6-liter VR6 found in the Cayenne and a number of other VW Group models. The 400-hp, naturally aspirated 4.8-liter V-8 that previously saw duty in the Panamera S and 4S makes way for a twin-turbo 3.0-liter V-6. The new powerplant is based on the 3.6-liter six, and produces 420 horsepower. Those who want the naturally aspirated 4.8 can still get their fix, via the Panamera GTS, which now pulls 440 horsepower from the mill versus last year’s 430. At the top of the range sits the Panamera Turbo, which keeps its twin-turbocharged 4.8-liter V-8, now rated at 520 horsepower—20 more than before. 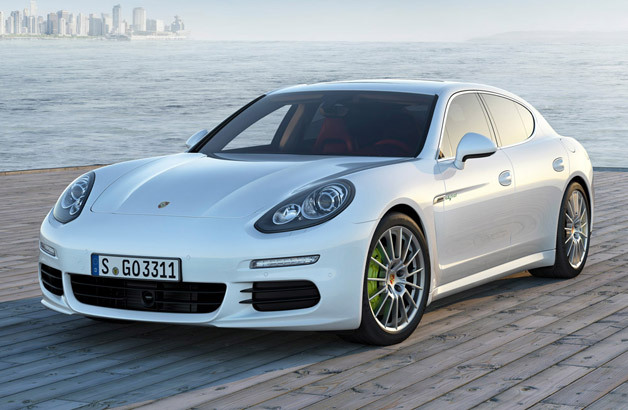 The Panamera S E-Hybrid (note that the “S Hybrid” designation has been binned) receives plug-in functionality and new batteries. While its Audi-sourced supercharged 3.0-liter V-6 remains unchanged, a new electric motor offers double the output. Accordingly, system power jumps from 380 horsepower to 416, and pure-electric range is said to be around 20 miles. The Panamera diesel remains confined to Europe, and keeps its 250-hp, Audi-sourced 3.0-liter TDI V-6. 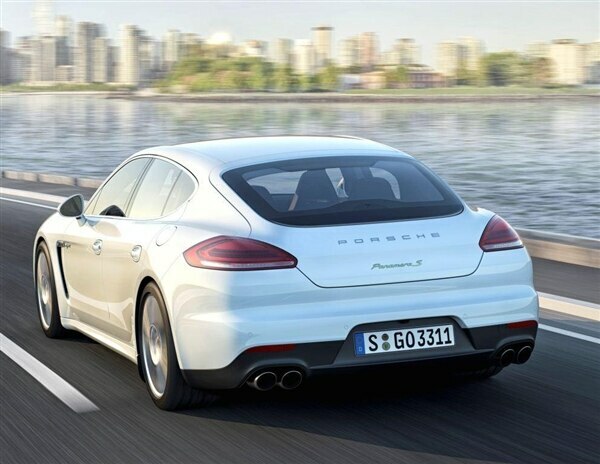 All Panamera models are equipped with a ZF-sourced seven-speed dual-clutch automatic, with the exception of the diesel and the hybrid versions, which are fitted with an eight-speed torque-converter automatic. Despite the increases in power nearly across the board, there is even more in the works. Next year, Porsche will increase its diesel output by 50 horses to an even 300, and the for-now-hiatused Panamera Turbo S will return with an output in the realm of 570 horsepower. Not only will all the Panameras get stronger, the 4S and the Turbo (and, eventually, the Turbo S) will be available in long-wheelbase form, undoubtedly to cater to the wishes of the Chinese market. Such stretched models will be referred to as "Executive," and will be lengthened by a whopping 5.9 inches—doing little to help the chubby sedan's proportions. Apart from the taffy-pull treatment, few changes have been made to the interior, although color and trim choices have been altered. Porsche has tweaked several exterior bits, including the front and rear fascias and the rear window, and full-LED headlights are available for the first time. In an attempt to counter criticism of the "hunchback" look, the backlight has been flattened and enlarged. Moreover, the taillight contour has been straightened, and the unpainted, plasticky portion of the bumper now encompasses more of the car’s rear end—a visual trick intended to reduce the visual heft of the car’s ample hindquarters. As before, GTS and Turbo models have a unique front fascia. 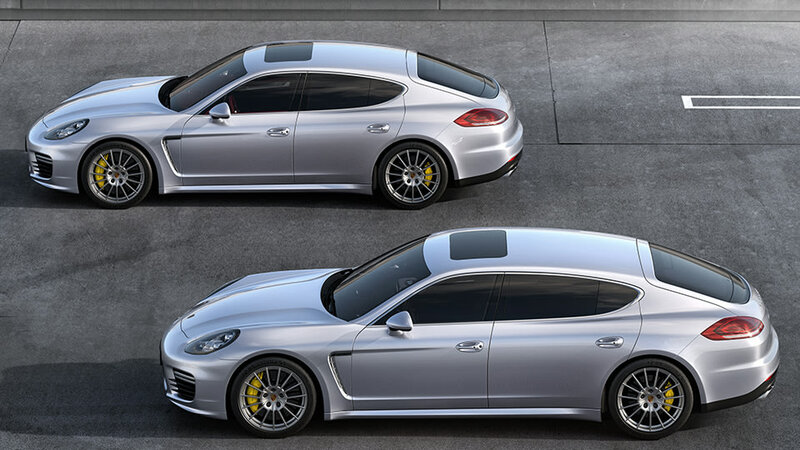 Prices for the new Panamera start at $78,100, an increase of $2250 over the current base model. The top-of-the-line Panamera Turbo Executive will set customers back $161,100, or 20 grand more than its regular-wheelbase sibling. The entire range of updated Panameras will arrive on dealer lots near the end of this year.